Dinner at Mandela’s hosts a cultural tour to Mandela Park township (Imizamo Yethu in Hout Bay, Cape Town), including a traditional African Meal, dancers, a choir, transport and music. 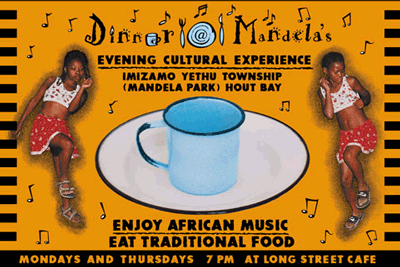 It is an opportunity for visitors to gain a better understanding of the lifestyle and culture of the residents and to have dinner in the township, a fun filled evening of African Music and Dance and partying with the locals. Simultaneously, our township tours afford the locals an opportunity to uplift their lives, as full support is given to the township in terms of services required – the local tavern/shebeen, support for traditional african choirs and local dancers and food. Our aim in the future is to be able to develop other community projects surrounding Dinner @ Mandela’s which will provide further upliftment to the people in the Mandela Park Township. … includes transport to and from Cape Town, a welcome drink, entertainment (traditional choir & dancers), a traditional African meal (served buffet style) and an amazing cultural experience! Is provided for the entire evening, so you need not feel uncomfortable bringing small valuables with you.